Keysight, an electronic measurement company, has introduced the industry’s first off-the-shelf testing and validation system for DDR5 DRAM. The N6475A DDR5 Tx compliance test software is aimed at developers of various products that will use the next-generation memory. 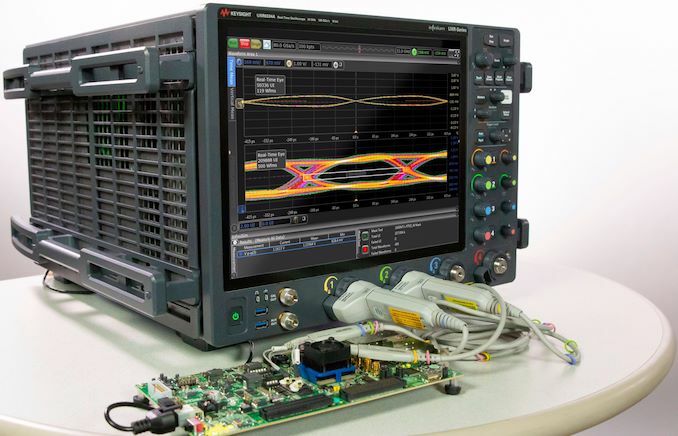 Keysight’s DDR5 testing and validation system includes the company’s N6475A DDR5 Tx compliance test software as well as its own M8040A 64 Gbaud High-performance bit error rate tester (BERT) and Infiniium UXR-Series Real-Time Oscilloscope hardware (though it can work with other hardware too). The application performs jitter, electrical, timing, as well as eye measurements, and is designed to test the transmitter PHY of DDR5 SDRAM, data buffer, and register chips. The program automatically compares the results with the DDR5 spec test limits and shows how closely the device passes or fails each test. Previously developers of various DDR5 products had to design their own testing software or perform all the measurements and analysis manually, which greatly lengthens development time. Now that Keysight’s DDR5 Tx compliance test software and hardware is available, it will be far easier for engineers to optimize transmitter, receiver, and channel designs. So this should speed up how quickly hardware vendors are able to bring DDR5-based devices to the market..
Keysight’s N6475A DDR5 Tx compliance test software and appropriate hardware is now available. Pricing is available upon request. The simplest explanation: What you essentially want from this diagram is figure out if you have reliable bit value of 1 or 0. So, you keep switching between the two and measuring voltage to see if you can distinguish the two. If your eye is wide open, you have a reasonably large window (both time and voltage) in which you can measure to know if you have a 0 or 1. If you have smeary mess of an eye that is barely open, your time window and voltage window is smaller. It will still work in a lab, but fail once you throw in real-world mess of temperature, component degradation, supply voltage/ripple or whatever else might influence the device. "M8040A 64 Gbaud High-performance bit error rate tester (BERT)"